YouGov BrandIndex Brand Advocacy Scores are calculated by measuring Recommend Scores among each brand’s customers for the twelve-month period through October 2016. Recommend scores for the brands are measured by asking, "Would you recommend the brand to a friend or family member, or would you recommend that a friend or family member avoid the brand?" Scores are calculated by subtracting the negative ‎responses from the positive responses. YouGov BrandIndex interviews thousands of consumers every day, yielding over 6 million interviews each year. Respondents are drawn from our online panels of 4 million consumers across 32 markets. 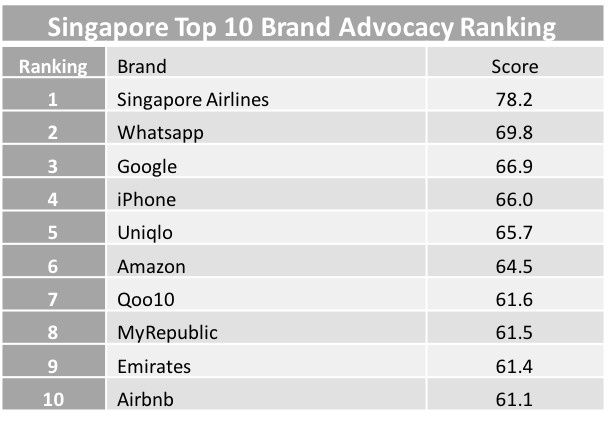 YouGov BrandIndex currently covers 250 brands in Singapore.